After the North and West of the country experienced high winds and torrential rain on Friday there was some hope that conditions would ease for the cross country fixture in South Cumbria on Saturday. The first fixture of the Mid Lancs League was held at the Glaxo site in Ulverston, where the River Leven enters Morecambe Bay. We were there last March when Hoad Hill Harriers hosted the final fixture of the 2017/18 season. The forecast for Saturday was for lighter winds but incessant rain and the drive there showed up many flooded fields. Ulverston and the cross country course itself was a little muddy in places. There was no flooding as such but there was increasing surface water in the Finish field from the intense rain that only really stopped when we headed home - hopefully having changed into dry clothing. Not everyone would have enjoyed the conditions but runners were generally appreciative of the officials and marshals who had the worst of it., standing in the rain for many hours. And there was a general air of goodwill and high spirits. A great and supportive atmosphere! The meeting was well attended albeit with numbers down on what might be expected at more central venues. But we did have many more than travelled here last March. There were only 28 Southport Waterloo runners, however; 9 juniors and 19 seniors. It is not a new phenomenon, but it is a continuing disappointment that more of our juniors don't experience the pleasure of cross country running in some scenic and exhilarating off-road locations. Our best result of the day was once again Olivia Logan's 2nd place finish in the Under 15 Girls' race and our Senior Men who won the Vet 50 team race. In the Juniors, we had six top 10 finishes. With none of our Under 11s running at Ulverston, the first club interest was in the Under 13 Girls' race where Grace Barr led our team home, 6th of 41 finishers in 10:22. Emily Dean finished very strongly, 12th in 10:47, and Libby Simpson was 19th in 11:13. The girls finished 2nd team so a great start to the season for them. As a final point about this race, it was a little shorter than the published 2.6 kms due to a misunderstanding about the start line. But all the girls ran the same distance. 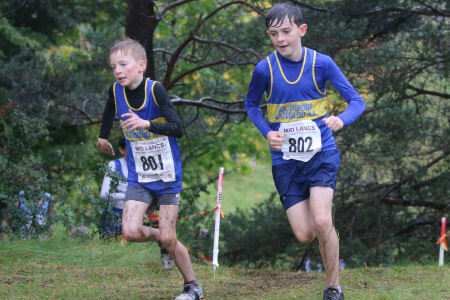 In the Under 13 Boys' race, Monty Barr and Sammy Pickerill were never far apart but it was Monty who pulled away and came though the Finish first, 4th overall of 36 finishers, in 10:34 for the 2.8 km lap. Sammy was 6th overall in 10:45. Hopefully we will see a few more of our Under 13 Boys at future fixtures and we can start to contest the team awards. Olivia Logan led the Under 15 Girls for most of the race but Leven Valley's Olesia Winder successfully challenged in the latter stages and Olivia finished 2nd of the 22 girls in 10:14 for 2.8 kms, just 2 seconds behind the winner. Millie Ireland also ran, finishing in 14:47. We had no Under 15 Boys running. In the Under 17 Women's race, both Jessica Dean and Freya Walsh competed, Jessica finishing 5th of 10 in 19:12 for the 4.4 kms 2-lap course. Freya came home in 21:18. I am hopeful we can field a successful Under 17 Women's team this season. No club managed a team finish at Ulverston! The Senior Women ran a 3-lap course for 6.4 kms. 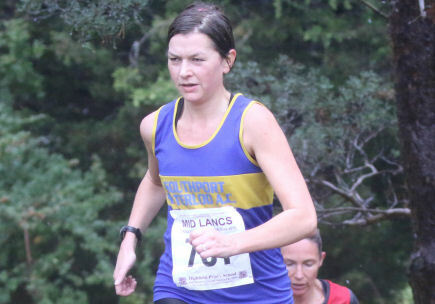 Michelle Spencer - the Women's new team manager - was the first of our six runners finishing 42nd of 156 finishers in 33:04. Previous team manager Carole James was next, 59th in 34:36, with Helen Lavelle 89th in 37:00. 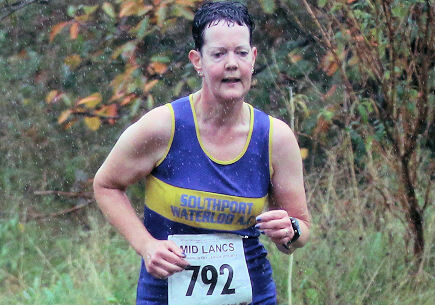 Sue Stewart was 2nd L65 in 40:45, Elaine Sutton finished in 42:44 and Sarah Pickerill finished in 43:44. Michelle, Carole and Helen finished 4th team in Div'n 1. 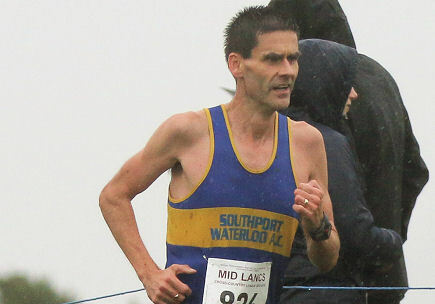 In the Senior Men's race Southport Waterloo fielded a team of 12 runners led home by David Hamilton. David was 15th of 251 finishers - 2nd MV50 - in 36:39 for 9.1 kms. Peter Roome was 54th in 39:27 - 4th MV50 -John Sprackland, 58th in 39:33 - 5th MV50 - Gareth Simpson, 62nd in 39:55, Richard Talbot, 97th in 42:18 and Keith Lunt was the final team counter, 101st in 42:33. The team were 8th overall but 5th team in Div'n 1. Other finishers were Martyn Smyth 42:35, Rob Johnson, 45:28, Clive James, 49:16, Neil Silcox, 51:34, Lee Coupland, 60:41, and Ian Pike 61:20. David, Peter, John and Richard were 4th Vet 40 team overall but 2nd in Div'n 1, and, with 4 top ten MV50 finishes, it was no surprise that David, Peter and John finished MV50 team winners. Thanks to team managers Michelle Spencer, Steve James and Lee Coupland. Fixture 2 is the British Athletics Cross Challenge in Sefton Park on Saturday 24th November. Then there is a December fixture; Saturday 8th at Hyndburn. As is often the case, this Mid Lancs XC fixture clashed with the Liverpool & District fixture in Arrowe Park. 5 of our Senior Men ran on the Wirral. Mike Taylor was 62nd in 43:52, Carl McMahon 67th in 44:38, Stephen Flanagan 104th in 49:34, Graham Liu 111th in 51:03 and Billy Hargreaves 129th in 55:35. Its very early in the indoors season but the young athletes taking part in the first of the South Yorkshire indoor series at the EIS Sheffield included six from Southport Waterloo. They were Adam and Lauren Byrne, Charlotte and Amber Hughes, Sierra Jalloh and Katie Piercy. Charlotte, Amber and Sierra moved up an age group for T&F, the competition year starting from the 1st October. This early, high performances are not expected but, In the shot, Amber set a new club record in her first competition in the Under 15 age group. Under 13 Lauren Byrne ran 9.26 for the 60m straight, cleared a best of 3m 79 in the long jump and put the shot 6m 20. Under 13 Adam Byrne ran a PB 9.60 for 60m, ran 32.61 for 200m and put the shot 6m 52 for 2nd place in that competition. Under 13 Charlotte Hughes ran 3:02.39 for her 1st 800m and put the shot 4m 32, a new PB. Under 15 Amber Hughes was 3rd over 60m in 8.44, cleared 4m 01 in the long jump and was 2nd in the shot with her new club record 9m 71. Under 15 Sierra Jalloh ran a PB 8.48 for 60m, 28.12 for 200m and put the shot 6m 69. Under 15 Katie Piercy ran 8m 78 for 60m, long jumped 4m 15 and put the shot 8m 85. The other meetings in the series are on 2nd December, 20th January and 17th March. Mike Walker represented England in the Chester Marathon on Sunday as a member of the England Masters' team. Despite a minor mishap at the 9 mile drinks station where he was knocked down and broke a finger, he won his age category finishing in 3:17:26 - an impressive time for a Vet 65 and 8 mins ahead of the second runner - and also won the MV65 international race winning him the gold medal and earning a place on our Honours Board. Mike helped England to a win over Wales, Ireland and Scotland in the international race. Mike's Chester Marathon time has placed him in 3rd position in the national MV65 rankings. He already tops the rankings for 20 miles..
James Brooker also ran the Chester Marathon, in 3:44:17. 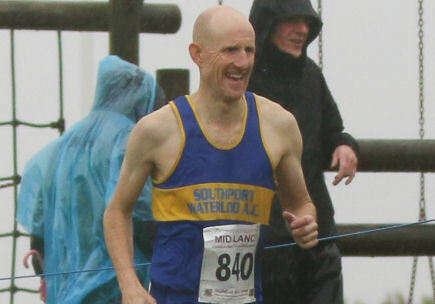 Elsewhere, Stephen Ward ran the West Coast Half Marathon, a point-to-point race from Preston Docks to Lytham St Annes Fairhaven. He ran 1:28:39. Kirkby Milers 10 mile road race through Knowsley Safari Park was again a popular choice for local runners on Sunday attracting nearly 800 finishers. The race, the final one in the Merseyside Grand Prix series, attracted 14 from Southport Waterloo. Going into the final M'side GP race, Mike Walker was lying 1st MV65 in the rankings; and Gina Bellhouse was lying 2nd FV50 so in line for end of season awards. 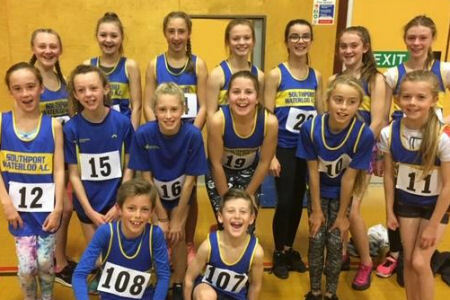 Up against Liverpool Harriers, Halton & Frodsham, Sutton St Helens and Warrington at the Kingsway Leisure Centre in Widnes, our Under 11 Girls won with 75.5 points ahead of Liverpool with 64.5 and Warrington with 62. The Under 13 Girls won with 110.5, St Helens getting closest with 92.5 and Liverpool with 80. Only three Under 15 Girls' teams competed at Widnes. Southport Waterloo scored 66, Liverpool 45 and Warrington 41. With just a couple of boys, we score 37 in the Under 11s. A full report will follow once the results of all the events have been mailed out to all team managers. The next meeting is on Sunday 11th November in the Old Stanney Sportshall in The Ellesmere Port Sports Village. Team Manager Chris Henders said "today’s first Sportshall League meeting went really well for our under 11, 13 and under 15 Girls as they all won their matches. Our two under 11 boys performed well considering their numerical challenges from the other clubs. The biggest result is shown in the team picture, smiles all round at the end! Well done to all our athletes and my two parent helpers today, Victoria Dean and Dave Griffin; plus our time keepers Dave Whitehead and Ron Scott." 8th November '18. Editor's update following belated publication of the results. Our Under 11 Girls were Sophia Crosbie, Erin Griffin and Hannah Keenan. Hannah won the 4-lap race and the long jump (1m 75) and was our fastest girl over 2 laps. Erin took maximum points in the 2-lap race as 'A' runner, she won the vertical jump with 37 cms and she recorded a count of 41 in the speed bounce. Sophia was 2nd 'B' in the 2-lap race, she cleared 3m 38 in the triple jump and she had a count of 26 in the speed bounce. William James and Harry Williams were our Under 11 Boys. Harry was 2nd overall in the 4-lap race and the vertical jump with a clearance of 36 cms and he recorded a count of 45 in the speed bounce. William competed in both the 2-lap race and the standing long jump, clearing 1m 49. Our Under 13 Girls were Maisie Bird, Ellie Clark, Emily Dean, Brianna Hanlon, Evie James, Apphia Keenan and Libby Simpson. Brianna won the vertical jump with 50 cms, the standing long jump with a best clearance of 6m 16 and she was 2nd in the 2-lap race, our fastest of the 6 girls. Emily won the 'B' 6-lap and competed in the 2-lap and the triple jump clearing 4m 44. Apphia won the speed bounce with an impressive count of 76 and the 'B' 2-lap race. Libby won the 'B' vertical jump with a 39 cms clearance, was 2nd in the 6-lap and long jumped 1m 84. Ellie won the 'B' shot with a best of 6m 00. She recorded a count of 57 in the speed bounce and was our best in the standing long jump with 1m 89. Evie was our 2nd fastest in the 2-lap race, cleared 4m 91 in the triple jump and 36 cms in the vertical jump. Finally, Maisie was our best shot putter with 6m 08. She had a count of 65 in the speed bounce and cleared 4m 38 in the triple jump. The girls won their 4 x 2-lap relay. Ellie Ireland, Eleanor James and Hannah Williams were our Under 15 Girls. Eleanor was 2nd in the triple jump with a best of 5m 06, and she won the 'B' long jump with 1m 91. Hannah was 2nd in the long jump with 1m 99. And Ellie was 2nd in the speed bounce with a count of 65.